You can check whether or not an elderly software application is able to take advantage of a dual-core processor by looking in the Performance page of Task Manager. 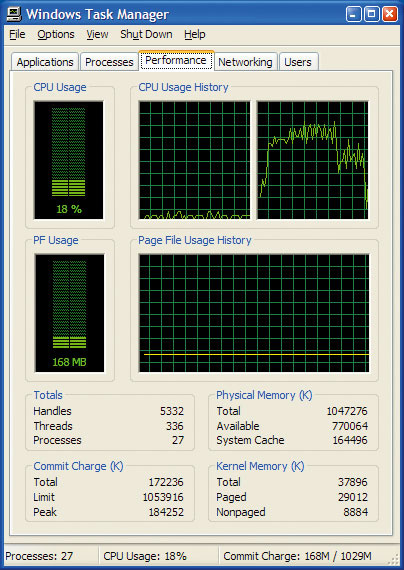 This application is clearly only using one of the two cores, as only one of the CPU Usage windows shows any activity. More Vista-related musings, advice on 'boot management' for multi-partition setups and the usual handy tips - all in this month's PC Notes. In last month's overview of Microsoft's new Windows Vista operating system (which should be on general release a couple of weeks before you read this), I sounded some cautionary notes for musicians, partly because of the mandatory 'digitally signed' drivers required by Vista's 64-bit incarnation. I suspect that far more users will opt to install the 32-bit Vista version when they realise it can still utilise unsigned drivers. Some early adopters of the 32-bit Vista have also reported limited success with various audio interfaces after installing existing Windows XP drivers, although this isn't something I'd generally recommend trying, since there are too many unknowns and stability may suffer as a result (many of those that have tried report at least occasional blue-screen crashes). However, as I write this at the start of the New Year, a couple of audio interface manufacturers have already released official 32-bit and 64-bit Vista drivers. The first were from RME for their Fireface 400/800 interfaces (www.rme-audio.com/english/download/drivers.htm), and MOTU followed a short time later with Vista 32-bit/64-bit public beta drivers for their entire hardware range, which are also fully compatible with Windows XP (www.motu.com/newsitems/vista-drivers-shipping). I'm hoping that the majority of other audio interface manufacturers are beavering away on their Vista drivers and that they will be available by the time you read this — but don't hold your breath! Meanwhile, Pace (www.syncrosoft.com) have also released a new version of their License Control Center software compatible with Vista 32/64-bit, so that dongle-protected music applications from Steinberg, Korg, Yellow Tools and the like can be tried out. Also, Propellerheads (www.propellerheads.se) have helpfully tested their product range with Windows Vista and posted the results on their web site, along with an updated Vista installer for Rewire and REX shared libraries that complies with Vista's enhanced security features. Many music software developers are still silent on Vista compatibility, probably because they haven't yet tested thoroughly with the final release version, although I suspect at least a few are simply hoping that their users will do the testing for them. My other concern last month was with Vista's DRM (Digital Rights Management), designed to prevent you from copying 'premium content' (mostly High Definition DVD and Blu-ray movies, but also other formats, such as Super Audio CD). Apparently, video and audio devices are required to implement AES128 encryption to receive premium content from Windows Vista, which requires extra hardware support on expansion cards, increasing cost and imposing extra processing overheads. If you attempt playback of this kind of copyright material on devices without such protection you may face automatic downgrading of both video and audio quality: apparently, analogue outputs are exempt, but digital connections such as DVI and S/PDIF may produce an output that looks or sounds fuzzier than normal, or may, in the worst case, be completely disabled. Also worrying is that both hardware and its drivers will apparently be polled every 30ms to check for such things as voltage fluctuations or signal jitter that might indicate potential hacking of premium content. This additional overhead has already resulted in dropped video frames and audio stuttering on a few review systems, and some industry experts even predict that Microsoft will eventually be able to remotely disable drivers that exhibit any inherent security weakness. None of these features ought to affect playback of our own original material, and of course the sensible approach is to wait and see what happens in practice, but I know full well that hordes of people will buy Vista as soon as it's released, so let's be careful out there: don't abandon Windows XP until you're sure Vista does what you need in a stable and reliable manner. Above all, remember that until each music developer makes an official announcement about Vista compatibility, you are their guinea pigs. As PCs are vulnerable to outside attacks while they are connected to the Internet, many musicians prefer to keep separate music-only Windows partitions and create a dual-boot system using a utility that lets them choose which instance of Windows they want to run each time they boot up. These work as follows. When you switch on your PC, its CPU takes control and runs the startup procedures contained in the BIOS. The last thing these do is to run the boot routine, which reads the MBR (Master Boot Record) from the first sector of the first physical hard disk. This contains a master boot program and partition table that describes how the drive has been divided up. If there is only one partition, the master boot program simply loads and boots the operating system installed on that partition. However, if there are several partitions it looks for the current active one and then runs the boot program contained in its first sector. To change your operating system, therefore, you have to make the desired partition 'active', and others containing other operating systems 'hidden'. Windows XP includes a utility to let you do this, but I've always found third-party 'boot managers' much easier to use, especially since most provide a graphic interface for their initial configuration, rather than making you manually edit text files to hide any OS partitions that you don't want to boot from and give names to those you do. We're often asked on the PC Music forum of the SOS web site (www.soundonsound.com/forum) whether or not a particular elderly software application will run well under Windows XP with a dual-core or Hyperthreaded processor. There's no way of knowing in advance how software code will react when faced with a processor that hadn't been designed when it was written and bug-tested, although you'll find plenty of tips on running legacy software under Windows XP in SOS January 2004 (www.soundonsound.com/sos/jan04/articles/pcmusician.htm). If the application seems to run OK, there is an easy way to find out if it's taking advantage of the multiple processors. 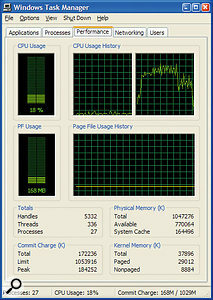 Just launch the Windows Task Manager (using the Ctrl/Alt/Delete key shortcut), click on its Performance page and look at the CPU Usage graphs: with a dual-core or Hyperthreaded processor there will be two windows (one for each processor core), and if the application is using both of them you'll see activity in both graphs. If, on the other hand, only one graph shows any sign of life, your application will only ever use half of the power available from a dual-core or Hyperthreaded processor. I've happily used Powerquest's Boot Magic for years (it comes bundled with their Partition Magic utility), but neither of these applications seems to have been updated since 2002, when Symantec took over from the original developers and brought them into their Norton product range. Sadly, this also means that Boot Magic must still be run from a FAT or FAT32 partition, and since nearly all of us now format our Windows partitions in the NTFS format, this is a major frustration (there is a workaround, but it involves creating a separate 50MB Primary FAT partition solely for use by Boot Magic). So, having built my new Conroe dual-core PC (see the PC Musician feature in SOS February 2006), I've been on the lookout for a replacement Boot Manager with no such restrictions, and there are certainly plenty to choose from. The Acronis OS Selector (www.acronis.com) is part of the Acronis Disk Director Suite that also includes the Partition Expert (similar to Partition Magic), Disk Editor and Recovery Expert, and costs a reasonable $49.99. Terabyte Unlimited's Boot It Next Generation (www.terabyteunlimited.com) also includes a partition manager, plus partition imaging capability, and costs just $34.95. These are both good options but if, like me, you've already got partition-management utilities and just want a boot manager, Star-Tools' Bootstar (www.star-tools.com) costs just $25 and can be recommended for its advanced partition-hiding features. Although I've never personally suffered from a virus attack that crossed from an active Windows partition connected to the Internet to another hidden (inactive) one, Bootstar incorporates 'true' hiding that deletes entries from the MBR partition table, so that they appear as unformatted space. This also means that you'll never suffer from the 'linked clone' problem I discussed in the PC Musician feature in SOS February 2005, when one Windows instance won't boot up without another being visible. It does, however, also mean that while Bootstar is installed you can't use partitioning utilities such as FDisk or Partition Magic, nor imaging utilities such as Norton's Ghost, although you can temporarily deactivate Bootstar to circumvent this. Another contender is OSL2000 Boot Manager (www.osloader.com), also $25 for a single user license, which can boot up to 100 operating systems, doesn't require a FAT or NTFS partition (as it installs itself directly into the first track on your drive) and has a host of advanced features, including Stealth mode, which automatically boots different operating systems without using a boot menu, and Auto Boot, which automatically boots different operating systems from the one currently running. With a simple yet informative graphic interface, GAG is one of the easiest and cheapest boot managers around.I finally decided on the GAG Graphical Boot Manager (http://gag.sourceforge.net), which also installs itself directly in the first track of your hard drive and thus requires no partition of its own. It can also boot up to nine different operating systems (perfectly adequate for most users). But what particularly appealed to me was that it can be run from a floppy disk without installing itself on your hard drive, which means that you can try it out easily without worrying about permanent changes. To do this from Windows you just double-click on the file named install_XP.cmd and have a floppy disk handy. GAG will create a bootable disk containing the utility. You can also create such a floppy disk from the DOS, Linux/Unix or OS/2 operating systems, while those without floppy drives can instead create a bootable CD-ROM. 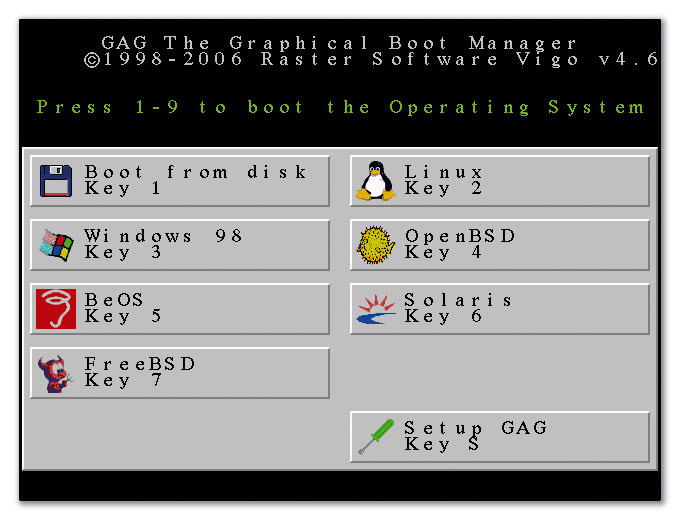 Once you've booted from floppy or CD-ROM, you configure GAG to display your choice of bootable operating systems from those it detects on your drives, choose icons for each of them and optionally hide all inactive primary partitions (this ensures that you don't see Windows partitions other than the one that's currently running). You can also set up an auto-boot timer so that your default OS boots after a user-defined number of seconds. Then you can save this configured version to the Master Boot Record of your hard drive so it's there for permanent use, or save it to your floppy disk. The included Install.txt file covers the bare bones of using GAG, but for in-depth coverage with lots of helpful screenshots, just point your browser at http://users.bigpond.net.au/hermanzone/p12.htm. GAG supports different keyboard layouts (QWERTY, AZERTY, QWERTZ, DVORAK and Cyrillic) and around 20 different languages, is distributed with full source code for anyone who wants to modify it, and its configuration can be password protected. I've personally had no problems while running GAG for several weeks on my PC, it will work with Windows Vista (so you can try this out while leaving your existing Windows XP installation intact) and, best of all, it's freeware!